Please see below for President Obama's full statement. 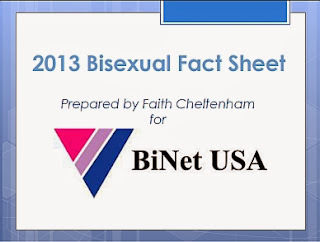 BiNet USA mourns the tremendous loss of life at the Pulse nightclub in Orlando, FL as the lesbian, gay, bisexual, transgender, queer, intersex and asexual (LGBTQIA) community celebrated Pride, a yearly celebration originally co-organized by bisexual activist Brenda Howard in New York City over 4 decades ago. Pride is a time we celebrate the diversity in our entire community and our collective gains for equality, but this week we worry, pray and hope for the safety of our entire LGBTQIA community. We urge the media, the LGBTQIA community and our allies to avoid characterizing this tragedy as a religiously motivated terrorist attack until all details are in. Let us avoid focusing on the shooter's ethnicity or religion and instead center our conversations around what work we can do to end the hatred that brings about such violent acts. We pray for love and light to guide our entire community in the days ahead. 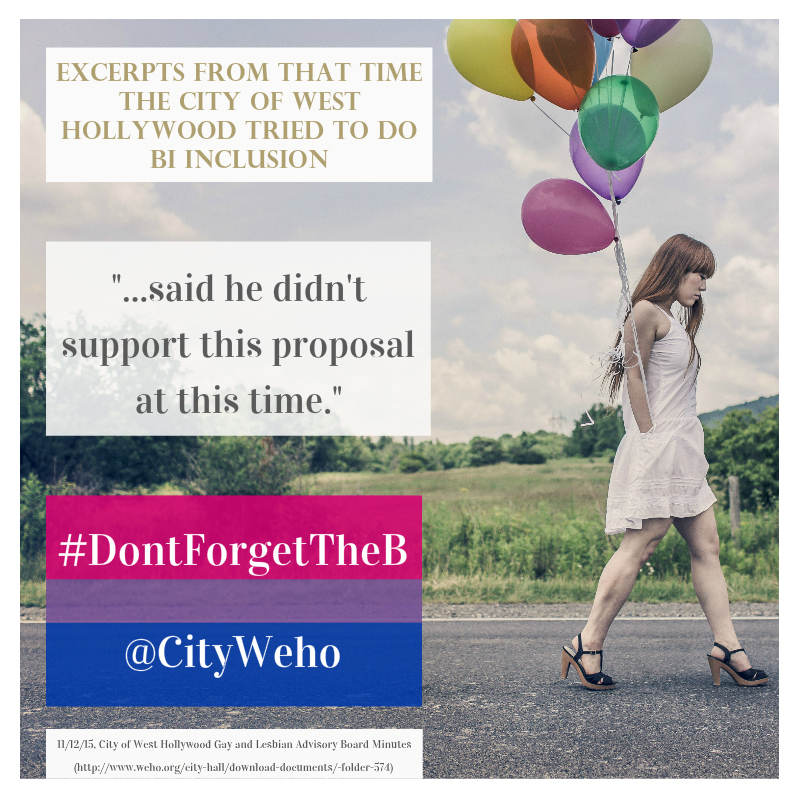 On 6/9/26, at 11:34am, the day of, the City of West Hollywood Gay and Lesbian Advisory Board cancelled their meeting when many bi people planned to attend. BiNet USA spoke to the board secretary and confirmed with a board member that the meeting would take place so this cancellation is upsetting. Many of us took off work, arranged childcare or changed our busy schedules to attend. Heck, I even cancelled on President Obama (thanks Robyn Ochs, Hayden L Mora and Tangela Roberts for standing up for all of us) and the White House LGBT Pride Reception. This is extremely disappointing and reflects the overall lack of care for local area bi, pan, fluid, queer (bi+) people I've come to expect from the City of West Hollywood. Seems like someone's sending us some messages beyond you don't exist, if we do, we certainly don't matter. We will attend next week's meeting but it's also be rescheduled for what looks to be a smaller room. Nevertheless, we persist in our existence and this isn't over yet! 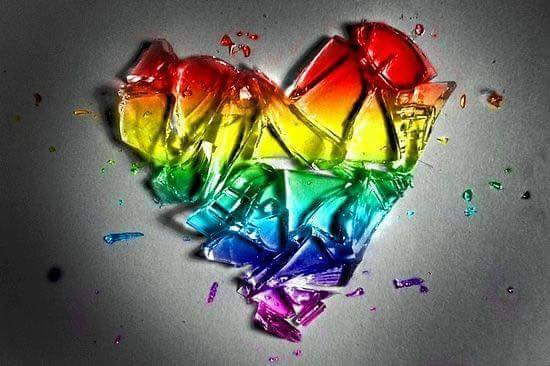 Wanted to let you know that the Lesbian and Gay Advisory Board meeting scheduled for tonight at the Library Community Meeting Room has been canceled due to lack of a quorum. There will be no LGAB meeting tonight. Parking for the June 16 meeting will be in the Kings Road Parking Structure, 8383 Santa Monica Blvd., 90069, on the northeast corner of Santa Monica Blvd. and Kings Road. A who's who of bi, pan, fluid, queer (bi+) culture and bisexual advocates have RSVP'd for the City of West Hollywood event TODAY! Can't make it? 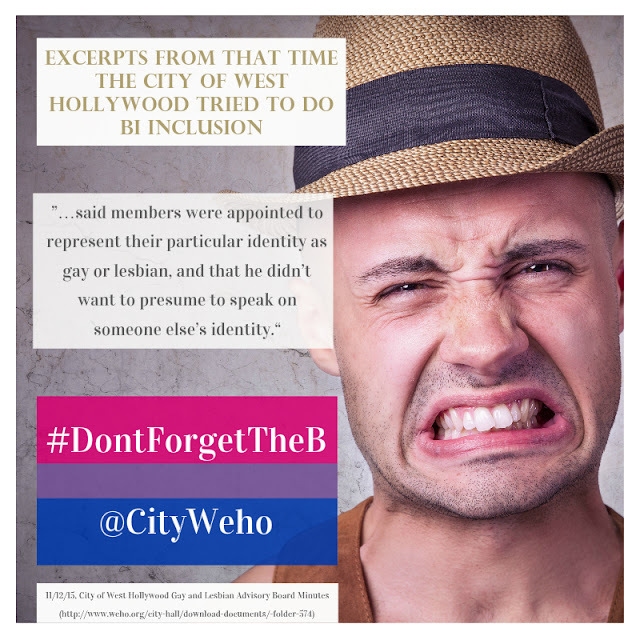 Tweet and share memes below in support of @wehocity creating a Bisexual Advisory Board! We need an advisory board that can focus on "bisexual specific" issues like 61% of bi women experiencing violence in their relationships nationwide and 35% of bi men reporting they had seriously considered or attempted suicide. Learn more about how domestic violence, poorer mental health and sexual violence affect bi communities. G. Elizabeth (Beth) Sherouse, Ph.D. (she/her/hers) is an academic and social justice advocate from Atlanta, GA. She currently works as the Senior Content Manager for the Human Rights Campaign Foundation. Before coming to HRC, she was an adjunct professor of U.S. and African-American History at the University of South Carolina, where she completed her graduate work. Her career in LGBTQ advocacy began as an undergraduate, when she cofounded Mercer University’s first officially recognized LGBTQ student group, which later led the Georgia Baptist Convention to sever its 173-year ties with the university. As a graduate student, she volunteered with progressive campaigns and organizations in South Carolina including South Carolina Equality and the SC Progressive Network. Dr. Sherouse holds a B.A. in History and Southern Studies from Mercer University (2006), and both an M.A. (2008) and Ph.D. (2013) in U.S. and African American History from the University of South Carolina. Zeam Porter (they/them/theirs) is an 18 year old bi, pan and trans femme non binary person of color. Zeam first came to the public eye when they gave an incredibly moving speech in December 2014 on how the state of Minnesota could best accommodate trans student-athletes. That testimony led to more appearances and opportunities for them to share their story including an appearance on Geena Rocero’s digital series Beautiful as I Want to Be with none other than Caitlyn Jenner who introduced Zeam to Matt Barnes, an NBA player with the Memphis Grizzlies. Zeam is also an accomplished artist and will graduate soon from The Blake School. Bryan J. Ellicott serves as Government Affairs Chair on the Staten Island PrideFest Committee and Spectrum Chair. He works at The Door as a Supervisor for Runaway Homeless Youth Drop-In Services. The Door is where Bryan empowers younger people to reach their potential by providing comprehensive youth development services in a diverse and caring environment. Bryan does that by facilitating groups and doing street outreach to NYC most vulnerable population our Runaway Homeless Youth. Bryan J. Ellicott is a born and raised Staten Islander from Great Kills. He attended all New York City public schools in Staten Island, as well as graduated from City University of New York College of Staten Island. He is active in New York City politics and activism. He works for the equal rights and protections of the transgender community in New York City and across New York State. 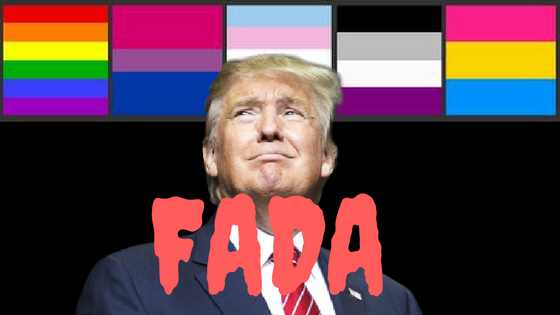 He is an executive board member of both SIDA (Staten Island Democratic Association and SDNYC (Stonewall Democrats of New York City). He was recently asked to join the Democratic National Committee's LGBT Advisory Board. When he isn’t working on Staten Island PrideFest, on a political campaign or legislative issue, Bryan can be found in drinking iced coffee at Starbucks and writing his memoir or researching various topics of interest online. Katy Butler is a recognized activist on the issues of bullying, LGBT topics, privilege and oppression, and diversity. Katy earned a B.A. in Sociology and Women’s Studies from the The George Washington University and she is currently finishing her Master’s in Education from The University of Illinois, Urbana. Katy has worked with GLAAD, The Bully Project, Equality Michigan, HRC and now is working in pediatrics on a project to help pediatricians better prevent bullying. She also petitioned the MPAA to change the rating of the inspirational film Bully from R to PG13 so kids around the country could watch this incredible film and start a conversation about bullying in their communities. Katy has appeared on Ellen, Anderson Cooper, CNN, Fox, MSNBS, in the New York Times, Daily Beast, Huffington Post and more. As a speaker, she connects with her audience on a personal level and inspires others to join her in working for a world with no injustice through dialogue and activities on various difficult issues. Katy’s passion to create change comes from her experience with bullying and she shares that passion through her programing. We salute AJ Walkley, Patrick Richards Fink, and Peter Ruggiero as they step down from the board at this time. We commend past, present and future board members for their dedicated service as volunteer activists for the bisexual+ community. Parking can be found in the 5 story structure with the elephant painted on the side. Parking there will be validated. We will be showing up to request the creation of a Bisexual Advisory Board for the City of West Hollywood and we want them to see the depth and diversity of our community. There is currently a Gay and Lesbian Advisory Board and a Transgender Advisory Board but no Bisexual Advisory Board! PLANNING TO JOIN US? RSVP on the LA Bi Task Force Facebook event page or on amBi's Meetup event page. Thank you LA Bi Task Force and amBi! Please bring your flags, buttons, or bi/pan/fluid pride gear so they know who we are! Partners, families and allies welcome! We will have pride gear for those who have none! CAN'T JOIN US? 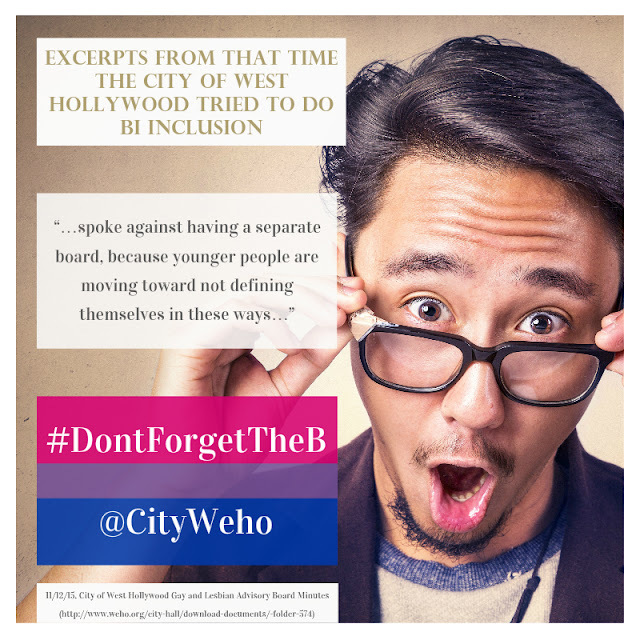 Participate digitally by tweeting @WeHoCity and using the tag #DontForgetTheB! 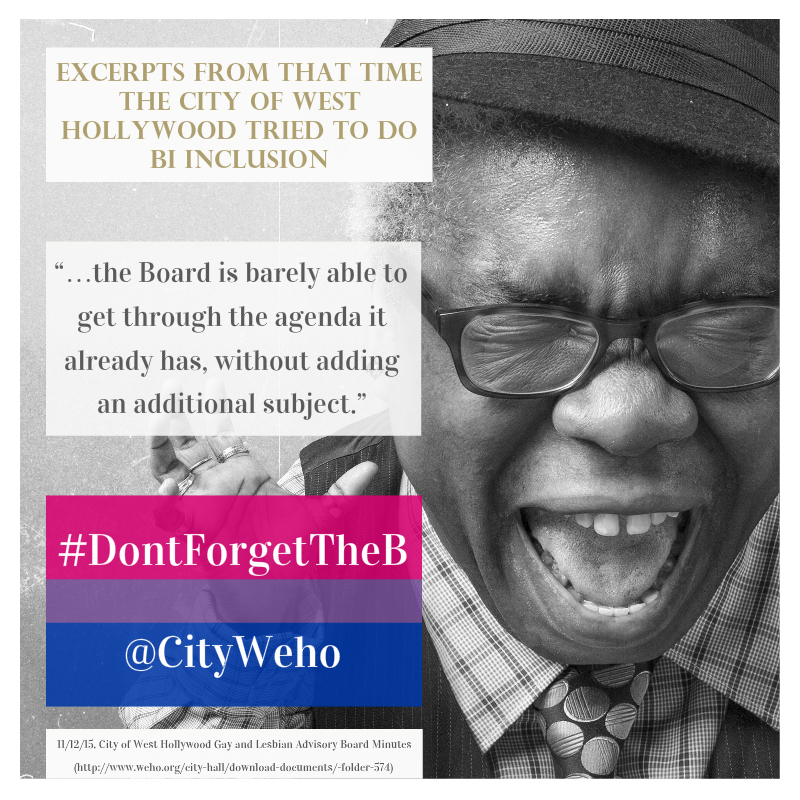 Back in Nov 2015, the West Hollywood Gay and Lesbian board considered adding bisexual to their name or creating a bisexual advisory board but did not do so (see the publicly available minutes below). We're showing up in person to ask again! 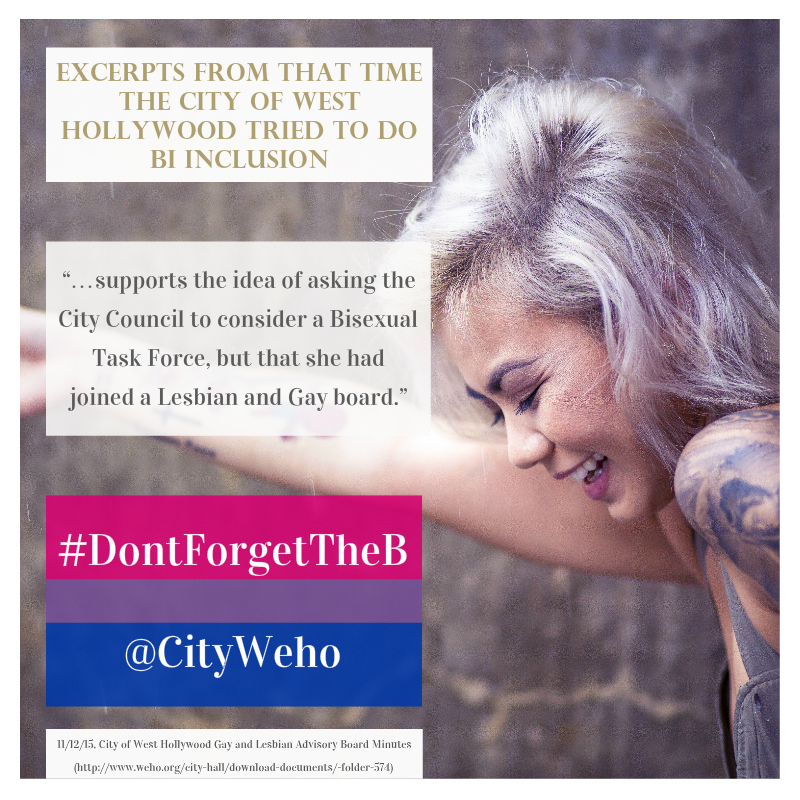 We'll be bringing copies of LA Bi Task Force's bisexual needs assessment for Greater Los Angeles as well as copies of the Movement Advancement Project report Understanding Issues Facing Bisexual Americans for the current advisory board. Public Comment: Nir Zilberman spoke in favor of adding `bisexual' to the Board' s name and mission, saying that there should be one board for all LGBT together, and that by excluding bisexuals we are taking their pride away from them. Public Comment: Jimmy Palmieri, Human Services Commission, said that this is a Gay and Lesbian advisory board, and the Transgender Advisory Board was formed to make educated decisions on transgender subjects. He said if bisexual people want to have their own board, the City should do that, but that it would not be serving bisexual people well to have their issues combined with others. Board Discussion: Board Members discussed pros and cons of adding the term 'bisexual' to the name and mission of this board. Beth Bishop spoke against having a separate board, because younger people are moving toward not defining themselves in these ways, and we need to have one larger board. Lucas John said he didn't support this proposal at this time. James Duke Mason said whatever action the Board takes should be moving toward greater inclusiveness, and that the Board could ask the City Council to begin a Bisexual Task Force. Marquita Thomas said that the Board is barely able to get through the agenda it already has, without adding an additional subject. James Duke Mason moved to ask the City Council to consider whether there is a need to form a Bisexual Task Force to do a needs assessment of the bisexual community. Ruth Tithe said she supports the idea of asking the City Council to consider a Bisexual Task Force, but that she had joined a Lesbian and Gay board. Matt Palazzolo suggested that Board Members talk to their own Councilmembers to see if there is a need for this in the community, and if so, to possibly come back with it in the future. Beth Bishop said the Board spends a large majority of its time on gay issues, and that people of all orientations might be better served by having one large board. Robert Oliver said members were appointed to represent their particular identity as gay or lesbian, and that he didn't want to presume to speak on someone else's identity. He seconded the motion by James Duke Mason. Public Comment: James Wen, chair of Transgender Advisory Board, said that we are moving toward having one voice as a community, and would like to help people form an LGBT task force, seeing the changing nature of the community.The motion was approved 9 to 1, with Lucas John voting no. members of the Board during the previous item. Nir Zilberman said he met with the City Manager and Mayor ProTern Meister today. He said three main concerns for him are bringing gay and lesbian homeless to the attention of the community, bringing back consideration of including bisexuality as a topic for the board, and making sure that homeless people are understood as individuals, instead of assuming that all are alike. Download more #DontForgetTheB Weho images here. Image Caption: Image says Emerging Leaders in a rainbow font with 7 young people of different ethnicities sitting in front of the word Leaders. HIGH SCHOOL STUDENTS WHO IDENTIFY AS LGBTQ are invited to register as “Emerging Leaders” to attend Point Foundation’s Washington, D.C. Policy & Law Leadership Education and Affinities Development (LEAD) Consortium. The Emerging Leaders Opportunity provides high school students with the skills and resources to become leaders in their local community. Emerging Leaders will attend the entire one-day consortium alongside Point Scholars and Alumni. Noted professionals and experts will lead sessions focusing on LGBTQ legislation and public policy, legal case studies, policy/law strategies, and the impact of litigation affecting the LGBTQ community. A session designed exclusively for student Emerging Leaders will address how to be a leader in high school, build connections with the community, and impact the local area as an LGBTQ student while developing skills for the future. Point Foundation (Point) is the nation’s largest scholarship-granting organization for lesbian, gay, bisexual, transgender and queer (LGBTQ) students of merit. Point promotes change through scholarship funding, mentorship, leadership development, and community service training. One of the reasons bisexual people may experience higher rates of domestic violence is an abuser's irrational fear that their bisexual partner may be unfaithful. See this moving story of a bisexual woman who lived through that scenario. For the media to perpetuate the myth that bisexual people are more likely to be unfaithful, and that lack of faithfulness is an excusable rationale for abuse, is reckless, irresponsible, and may perpetuate further violence against bisexual people. We strongly encourage all media outlets to do their due diligence and frame Heard’s experiences in light of the legitimate health statistics and data that show bisexual women are at greater risk of intimate partner violence. By omitting these facts and instead choosing to frame Heard’s experiences as the result of her orientation is victim-blaming, irresponsible and damaging.